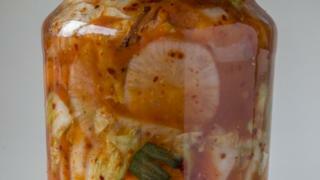 Is fermented food a recipe for good gut health? Fermentation as a way of preserving food dates back thousands of years, but it is now being held up as a potentially important source of friendly, health-giving bacteria. So should we all be eating sauerkraut and kimchi? Allowing bacteria to form in a sealed jar of vegetables over a few months might not seem like the most appealing way to create an appetising dish, but fermentation has a lot going for it. Just ask the Koreans and Japanese, who have been fermenting vegetables, fish and beans for generations. When the Korean cabbage dish kimchi is made using traditional methods, cabbage is soaked in salt water to kill off any harmful bacteria. In the next stage, the remaining bacteria, called Lactobacillus, convert sugars and carbohydrate into lactic acid, which preserves the vegetables and gives them a tangy flavour that many people love. This type of bacteria is not the enemy - it is actually good for our digestion and for our health. We need it in our guts to fight off the harmful bacteria, restore the balance of our immune system and help the body to work at its best. These "good bacteria" are called probiotics, which literally means "for life", because of the job they do. Tim Spector, professor of genetic epidemiology at King's College London and author of The Diet Myth - The Real Science Behind What We Eat, says it is a complicated picture. "There are many fermented foods out there and not many have had formal testing so it's difficult to know what they do," he says. "But there's nothing harmful about them if they are produced naturally, rather than using vinegar." Fermented food comes in many forms, for example, yoghurt, sour cream, sour dough bread, vegetables, chutneys and pickles. Often probiotics are added, in the form of live bacteria or yeast, if the foods are not made using lactic acid bacteria as in kimchi. Even wine and beer can be included on the fermented list, but they are not all beneficial to the same degree - and so they cannot all be classed as healthy. The most important consideration is whether the good bacteria can survive all the way through the gut to the bowel and the colon where they have a chance to be of benefit. Studies suggest this is not guaranteed and that probiotics would have to be eaten regularly and in quite large numbers to survive the journey. If and when they manage to breed in the gut, scientists have a theory about the role they perform. "We think they can allow production of chemicals called short-chain fatty acids, which improve the immune system, by keeping it balanced and stopping it over-reacting," says Prof Spector. A great deal of research is being carried out to find out if taking probiotics can improve the health of people with specific disorders. So far it has been suggested there could be benefits for those with irritable bowel syndrome and inflammatory diseases of the intestines. They may also improve allergies in babies and the health of people with weak immune systems. But Prof Spector says that while studies on the effect of probiotics on animals in the lab are convincing, research on humans is still lacking. The very sick, the very young and the very old are mostly likely to benefit from probiotics if their guts are weakened, but as yet there is little evidence they do much for a healthy person. Instead, the key may be to focus on prebiotics, which feed the beneficial bacteria in our guts, nurturing them and helping them to grow. This is an area Dr Gemma Walton, a gut microbiologist from Reading University, has been investigating and she has found encouraging evidence that a prebiotic diet can increase the numbers of good bacteria in the gut. She said mothers' breast milk was a good example of a prebiotic because it supported the growth of health-promoting bacteria. Bananas are another prebiotic, but Dr Walton says: "You would need to eat 10 bananas a day to get enough of the compound." Onions, asparagus, chicory and garlic act as prebiotics too. Sauerkraut (cabbage), yoghurt, kimchi and miso soup are just some of the fermented food products which contain the live microbes needed to keep the good bacteria alive for longer. However, Dr Walton says it is difficult to know which fermented foods will hit the spot. "All foods have a different mix of bacteria which means some will be more beneficial than others," she says, before adding that bacterial ingredients in food products were often unclear. There are trillions of bacteria living in our guts and on our bodies - more than 10 times the number of body cells in one individual. "If we can help to get more fibres down there in the gut then it's a good thing," she adds. The answer to all this may be found in British Gut Project, which is analysing the gut bacteria of 2,000 people. The aim is to find out which species of bacteria exist in the gut and which groups in the population have the most species in their bodies. Ultimately, researchers will be able to answer the question of whether there is such a thing as a perfectly healthy gut - and what feeds it. So it would be no surprise if Western diets, which are dominated by sugar and processed food, are in need of more probiotics to top up the gut's bacterial swamp. "A bit of fruit and natural yoghurt for breakfast perhaps, try kefir, sauerkraut, miso soup, kimchi..." he says. BBC Two - Trust Me, I'm a Doctor - Do probiotics do any good? BBC Future - Can your gut bugs make you smarter?